Adorning the cover of numerous postcards and guidebooks, a visit to Lisbon’s beautiful, UNESCO-listed Belém Tower features on almost every visitor’s itinerary. If you’d like to know more about visiting this 500-year-old structure, we’ve put together this comprehensive guide to the tower’s history, how and when to go, tips for buying tickets, what to expect once you're inside, and more. Back in the 15th century, the king and his military advisers realized Lisbon’s existing defensive forts at the mouth of the Tagus river didn’t provide enough protection from sea-based attack. Plans were drawn up in the early 1500s to add a new fortified tower on the northern bank of the river, a little further downstream where the Tagus was narrower and easier to defend. A small island of volcanic rock just offshore in Belém was chosen as the ideal site. Construction started in 1514, and finished five years later, with the tower named Castelo de São Vicente de Belém (The Castle of Saint Vincent of Bethlehem). Throughout the next several decades, the structure went through a series of upgrades and additions to further strengthen its defensive capabilities. Over the centuries, the tower ended up having other purposes beyond just defending the city from the sea. Troops were stationed in an adjoining barracks, and the dungeons of the tower were used as a prison for 250 years. It also served as a customs house, collecting duties from foreign ships until 1833. The tower had fallen into disrepair by that time, but major conservation and restoration works didn’t begin until the mid-1900s. A significant European science and culture exhibition was held in the tower in 1983, which was classified as a UNESCO World Heritage Site the same year. A year-long full restoration was finished in early 1998, leaving Belém Tower as it appears today. It was declared one of the “Seven Wonders of Portugal” in 2007. At the southwestern edge of Lisbon’s official city limits, the popular neighborhood of Belém lies about five miles from downtown areas like Alfama. Getting there is straightforward: trains, buses, and trams all run along the river from Cais do Sodre and other main stations, all costing under three euros for a single ticket. Ferries also run to Belém, but only from a couple of terminals on the southern bank of the river. Taxis and ride-sharing services like Uber are also inexpensive, especially when traveling in a group, and it’s also a pleasant, flat walk along the waterfront under the striking April 25 bridge, with plenty of other attractions, bars, and restaurants along the way. 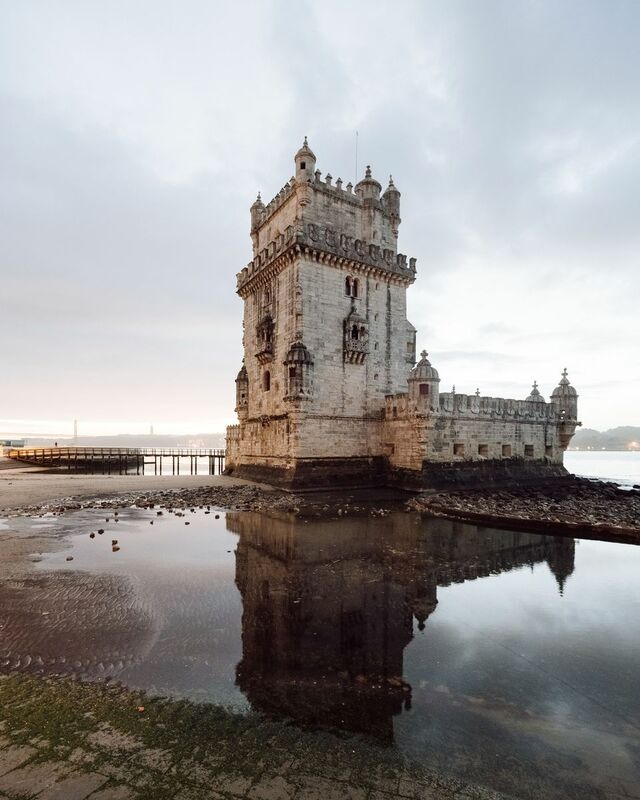 While Belém Tower was originally freestanding in the Tagus River, subsequent extensions of the nearby riverbank means it’s now only surrounded by water at high tide. Access to the tower is via a small bridge. The tower opens to visitors from 10 am, closing at 5:30 pm from October through May, and at 6:30 pm the rest of the year. Oddly, last entry is at 5 pm, regardless of the closing time. When planning your visit, note the tower is closed every Monday, as well as New Year’s Day, Easter Sunday, May Day (1 May), and Christmas Day. You can still take photos of the striking exterior when the tower isn’t open, of course, but you won’t be able to get inside. Head around to the right of the tower for the best photos, away from the line and busy pedestrian area. Sunset is a particularly good time for shots of the tower, framed against the river and orange sky. Due to its popularity and relatively small size, the site gets very busy in summer, especially from late morning to mid-afternoon, when many of the tour buses and groups show up. For a more relaxed experience, it's worth arriving early, or towards the end of the day. Lines often start forming half an hour before opening time, and as people are only allowed in and out in groups, it can be slow-moving. Expect to spend around 45 minutes inside. For most visitors, the highlight of Belém Tower is the open terrace at the top—but don’t try to rush through the rest of the structure just to get there. A single narrow, steep staircase provides access to all floors, including the roof, and it can get quite crowded. A red/green traffic light system controls whether people can ascend or descend at a given moment, and the wait provides an excuse to explore each floor on the way up or down. The ground floor once housed the tower’s artillery, with cannons aimed out across the river through the narrow window openings. Several of those large guns remain in place today. Below them (and therefore below the waterline) lies the magazine, originally used for storing gunpowder and other military equipment, and then transformed into a dark, damp prison in later centuries. Above that sits the Governor’s Chamber, where nine successive governors worked for over three centuries. Little remains in the chamber now, but it’s worth squeezing your way through the narrow tunnels at either end to get to the attached turrets. From one of them, you can see a small stone sculpture of a rhinoceros head, apparently created to commemorate the arrival of one of the first rhinos in Europe, as a gift for King Manuel 1 in 1514. Climb up once more to enter the King’s Chamber. The room itself is relatively unexciting, but it provides access to a Renaissance-style balcony with great views over the lower terrace and river. Above that lie the Audience Chamber on the third floor, and on the fourth floor, the former chapel which has been converted into a small theater showing a video history of the tower and Portuguese Age of Discovery. Finally reaching the top, you’ll be rewarded with a sweeping view over the ramparts of the waterfront, river, and surrounding neighborhood. The April 25 bridge and statue of Christ the Redeemer on the opposite bank are both clearly visible, and it’s the perfect spot to snap a few iconic Lisbon photos. A single adult ticket costs six euros, with a 50% discount for visitors 65+ years old, those in possession of a student or youth card, and families of two adults and two or more children under 18 years old. Children under the age of 12 are admitted free. It’s also possible to buy a combined ticket that gives access to Belém Tower, and the nearby Jerónimos Monastery and National Archaeology Museum, for €12. One important tip: during busy periods, it’s well worth buying your ticket before arriving at the tower. It can be purchased from the nearby tourist information office, or as part of the combination pass mentioned above. The often-lengthy line for tickets at the tower itself is separate to the entrance line, and can be skipped entirely if you already have one. Note that even if you have free access via a Lisbon pass, you still need to pick up a ticket—the pass itself won’t get you inside the tower. Given its location, it makes sense to combine a visit to Belém Tower with other nearby attractions. The majestic Jerónimos Monastery is only a 10-15 minute walk away, and as mentioned, combination tickets to both attractions are available at a discounted price. Close to the monastery sits the Pastéis de Belém bakery, the original home of Portugal’s famous pastel de nata egg tart—after climbing up and down those 200+ stairs, a little treat is definitely in order! There may be a long line there as well, but it's very much worth the wait. Finally, for something a little less historic, but no less interesting, walk back along the waterfront to MAAT (the Museum of Art, Architecture and Technology). Housed in a former power station, and only opened in 2016, you’ll pay €5-9 to go inside—or, if you haven’t got your fill of photogenic spots quite yet, just head up top to the viewing area for free.